The vicious fight for survival and power among disparate kingdoms and clans may have led some ancient people to evolve facial traits more quickly than others, a study said Thursday. 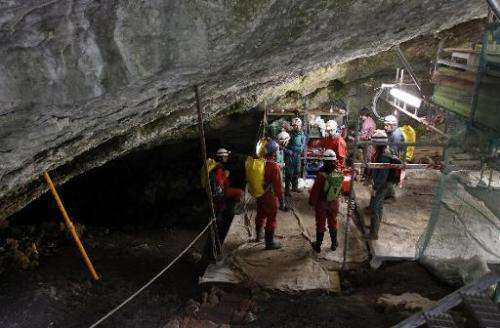 New research on 17 skulls from a collection of 430,000-year-old remains found at the base of an underground shaft in Spain suggests that big jaws were the first prominent feature of these pre-Neandertals. 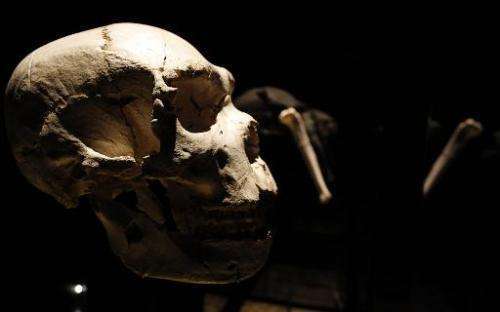 The fact that their skulls were compact, suggesting a small brain, indicates that the development of the larger brain seen in Neandertals came later in the evolutionary process, according to the study in the US journal Science. Scientists say they may have been pitched—ceremoniously or not—into a pit by their conquerors. Lead researcher Juan-Luis Arsuaga from the Complutense University of Madrid described their story in terms of "Game of Thrones," a popular fantasy television series based on novels by George R.R. Martin. "It is now clear that the full suite of the Neandertal characteristics did not evolve at the same pace." Mitochondrial DNA on one of the fragments shows that these people were not Neandertals. Their remains also date to about 200,000 years before the Neandertals are known to have existed. "It is possible that they represent a single clan," said Rolf Quam, a paleoanthropologist at Binghamton University in New York. "The origin of this accumulation could be called the biggest mystery in archeology," said Arsuaga. The remains are also different enough from Neandertals to be considered a separate taxon, the study said. Who was eating salmon 45,000 years ago in the Caucasus? If you are mostly a hunter, you eat if you work together in a group. Your terrain is like what you find around the Kentucky river where people hunted mammoth and other large animals not so long ago. They waited for the drivers to get the animals to move quietly through paths that took them to the river. When man invented archery, one person could kill a lot of food and the hunter society was not needed. Humans could be solitary. Neanderthals used music, ornaments, rituals, cared for the sick and ederly which points to strong social bonding. Strong facial features and body helps prevent death from broken bones fighting an injured animal. In other animals, fighting, strength and size is used in mate selection. Killing one of your own hunters will not make sense unless something is very, very wrong. "Their large mandibles could gnash meat, open wide and be used like a tool or a third hand, helping them adapt to their eating needs in a harsh, cold environment." And/or, as another hypothesis suggested here recently, their mandibles were strengthened to survive fist blows, an aggressive skill that our handyman ancestor evolved together with the precision grip hand. In fact, it would suit the GoT-ic scenario like [ahem] hand in glove. @EnricM: The new thing, apart from the long and careful dig assembling statistics (28 individuals! ), is the genome sequencing. It's a first for so old material, and it is why the subspecies discussion becomes so urgent. But yeah, the assemblage has an old history [sic! ].